Mix the wholemeal flour, oats, cinnamon, nutmeg, yeast and a pinch of salt in a mixing bowl. Warm the milk, vanilla and honey just a little until just slightly warm, then pour into the mixing bowl along with the egg and oil. Mix the dough for about 6 minutes until it is smooth and elastic. Add the dried fruits and mix through. Cover the bowl and leave the dough to double in size in a warm environment for about an hour. Pour the dough onto a floured chopping board or work bench. Kneed a little then shape into 10 rolls. Cover lightly with a damp tea towel and allow to rise for another 30 minutes. 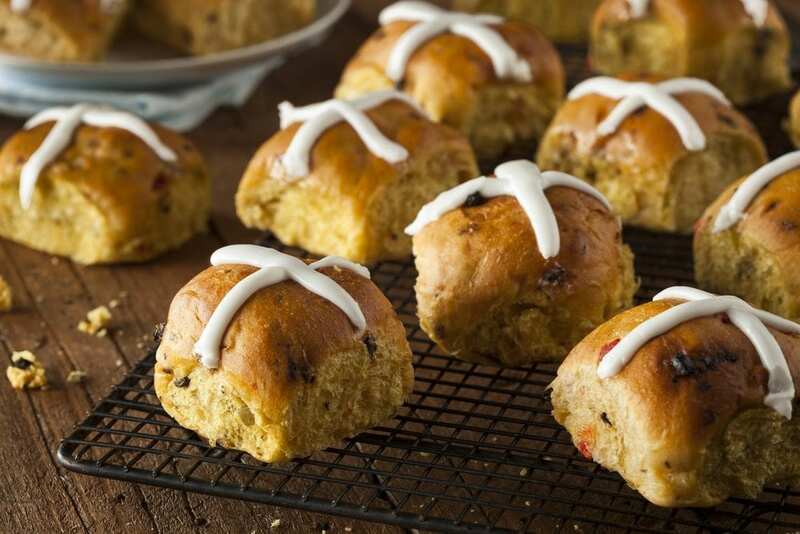 Allow to cool, then make a cross on the buns using your favourite Forever Free yogurt.